Air/Oil Lubrication consists of an air stream, that normally operates continuously, used to provide cooling to the lubrication point and as a transport medium to carry small quantities of oil to the lubrication point. The oil-injected into the air stream at regular intervals coats the surfaces to be lubricated and reduces friction and wear. These small all-enclosed devices are ideal for use on small systems and offer fully integrated control and monitoring in a single compact package. Typical applications: high speed bearings, spindle lubrication in machine tool, micro-spray coating applications, gear lubrication, chain lubrication and cleaning. The Vip4 Air System offers one of the most compact and feature rich air/oil systems available for spindles and it is able to achieve a significantly reduced amount of lubricant dispensing and positive feedback is a must for such systems. 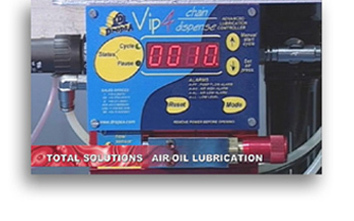 A variant of the Vip4 Air, specifically aimed at chain or conveyor application can be used in any application where the lubrication cycle is not time driven but impulse driven. On a typical application, a sensor connected to the Vip4 Chain monitors the number of links passing across the lubrication nozzle and fires a micro quantity of oil onto the point thus increasing chain or conveyor life without lubricant wastage that can drip off the chain and contaminate the industrial process. 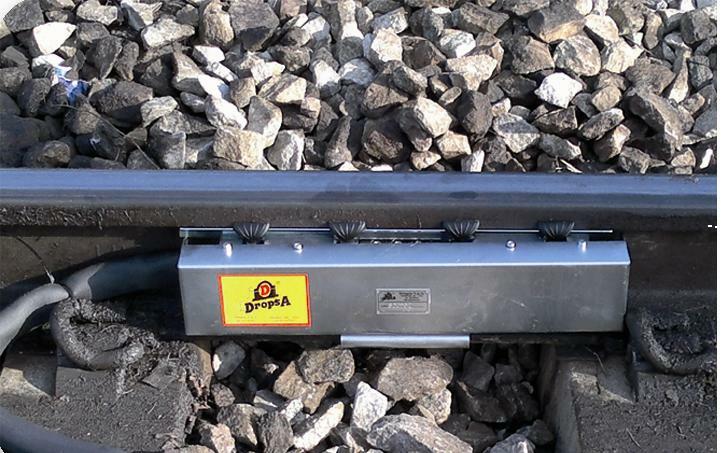 - Integrated or Remote Cycle Control. Dropsa Air/Oil satellite system for steel industry. Dropsa has a completely modular approach to designing large air-oil systems used primarily in the steel industry. A centralized oil feed-line is used to develop pressure at the satellite stations that periodically inject oil, into a continuous air stream. Each satellite station monitors the oil and air outbound to the lubrication point and contains local indications that allow the user to see at a glance that everything is working smoothly. The satellite stations are cabled back to the central touch screen control system with a signal network cable eliminating the requirement for expensive cabling runs. Every distributed instrument and control can be viewed and adjusted from the central touch screen.